This is another post from a year ago that I thought would be fun to revisit. If you're unfamiliar with the traits of Virgos, we are perfectionists and obsessive neat freaks. The phrase "a place for everything and everything in its place" must have been written by one of us. I thought I'd show you the shelves in my studio/office, and realised what an accurate reflection of me they are. Kind of sad really isn't it? Of course my shelves are the ubiquitous Expidit shelves from Ikea... as seen in half the homes around the world. 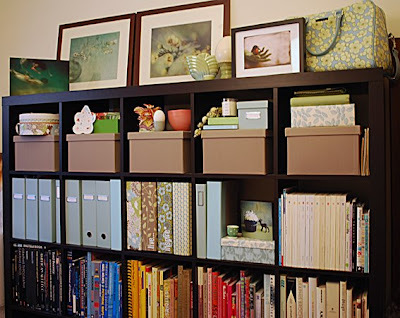 My aqua files are from KikkiK, the neutral coloured boxes are Ikea, and the patterned boxes and folders are cheap ones that I covered with paper. I'd had the boring Lever Arch files for maybe 10 years in my cupboard, and I covered the spines with paper to achieve a fast and cheap makeover. The patterned boxes are just any box that comes may way (like software boxes, gift boxes, etc), which I have covered. Too easy. You will also see some of my etsy art purchases and various bits and pieces on display. And I've succumbed to the trend of organising my books in order of colour - I love the look, but it does make things harder to find. Which sort of creates a dilemma for my ordered Virgo sensibility: do I go for the beauty of the look, or the logic of order?